Equal amounts of plantain (plantago lanceolota), nettle (urtic dioica), eyebright (euphrasia officianalis) and elderberries (sambuccus nigra). Steep in one cup of boiled water for 10 – 15 minutes and then drink. Can be sweetened with a teaspoon of local honey, which can have an homeopathic effect as it would contain pollen from the area in small doses. Equal amounts of plantain (plantago lanceolota), elderberries (sambuccus nigra) and chamomile (Matricaria chamomilla). Plantain is a great antihistamine, and nettle boosts the immune system. Elderberries and flowers are great for coughs and colds – I didn’t have any flowers to hand but did have some berries. Eyebright works well for coughs as well, and can be applied as a poultice or eyewash, however, only organic and well-strained infusions should be used on eyes – if in doubt, don’t use it! Chamomile is to help give a restful sleep, which is also a good immune system booster. As dairy products create more mucous in the body, it is best to avoid dairy during hayfever season. If you simply cannot live without, goat or sheep’s milk or cheese is better. High fat food should also be avoided, and fresh vegetable and fruits should be eaten to boost the immune system. Exercise gets the lymphatic system going, and helps circulation, releasing toxins, again helping your immune system. I’ve been taking the tea for a week now, and my sinuses have cleared almost straight away. I still have a cough, and may switch the elderberries to elderflowers to see if that makes a difference for me personally. On with anatomy and physiology homework! 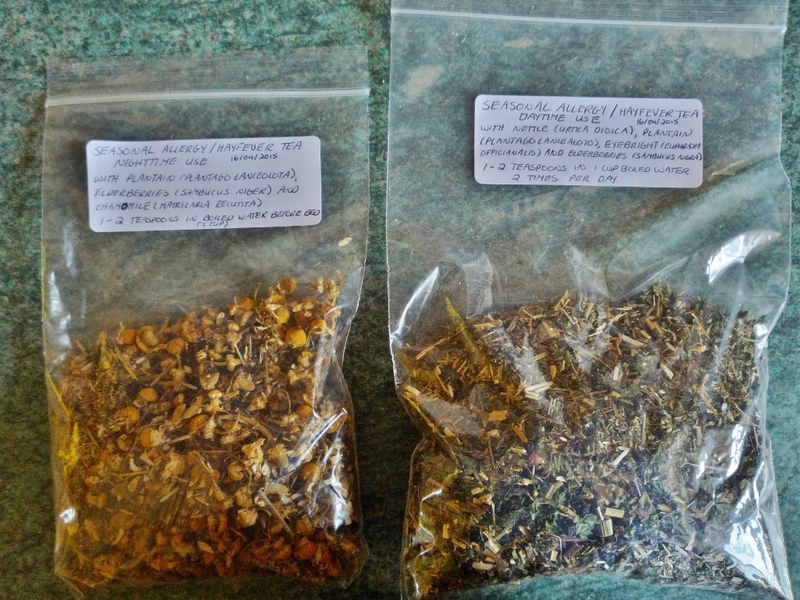 Categories: Allergies, tea | Tags: allergy, chamomile, elderberry, eyebright, hayfever, nettle, plantain, tea | Permalink. I’ve just had my first weekend session on my three-year professional herbalist diploma course – my head is overflowing with information, my head overflowing with inspiration and my heart overflowing with love for this wonderful planet we call home! This month I will be looking into allergies, specifically hayfever. I am to prepare two herbal teas for this condition, and already have a good idea what I shall be using, but will share with you all later on this month on preparation, taste, efficacy and more. I am also going to prepare two flower essences – you may have heard of the Bach Flower rememdies. Well, I shall be creating my own, through research with each plant as well as personal meditation and reflection. Working with the vibrational energies, the spiritual as well as the physical, is what I love about this course. I shall also be choosing 12 herbs to begin create my own personal herbal, to be finished hopefully by June. I will, of course, be working with more than twelve, but this will be the start of my journey, and the plants that call to me most – my plant allies, if you will. So, stay tuned, and I shall be updating you with more info soon on my journey into the healing realm of plants! Categories: Allergies, Flower Essences | Tags: allergy, Bach flower remedies, flower essence, hayfever | Permalink.